I'm still really nervous about tomorrow's race, but I've been distracting myself all week with various activities. There was my final group training run on Tuesday, Chick's Night at Fleet Feet on Wednesday, then the expo and packet pick up yesterday and today, candle light yoga last night, a shake out run this morning...now all that is left is to wake up before the sun tomorrow and run 13.1 miles. I went to the expo yesterday to pick up my packet and see what there was to see. It was nice walking around the Magnificent Mile and spending a couple of hours out and about. The expo was at Pioneer Court on North Michigan Avenue and was held in conjunction with The Magnificent Mile Shopping Festival. "Public Event" means that there are a lot of tourists confused about all the people in running clothes. Before checking out the various booths, I got down to business and picked up my packet. The lines were surprisingly reasonable and moved very quickly. I had originally ordered an XL shirt, but they were nice enough to let me exchange it for a large right there at pick up. The race organizers planned well and had some shirts set aside specifically for exchanges like this, and it was great being able to do it right away instead of having to wait until race day. It took maybe five minutes to get my packet. Thanks for keeping things moving, Fleet Feet! Once I had my shirt and bib number, everything suddenly felt much more real. This was really going to happen! I was going to run a half marathon! I plan to take my shirt with me in my gear check bag to change into after the race. I checked out the various booths - there were lots of different Magnificent Mile stores with booths handing out information and doing raffles. There were a few samples and give aways (I got a free drawstring bag from North Face by showing my bib number), but some of the booths were just too crowded (Nordstrom had some cool activities and give aways, but the line was ridiculous and was moving too slowly), and I just didn't feel like waiting in a long line. 50% Off running clothes? Yes, please! 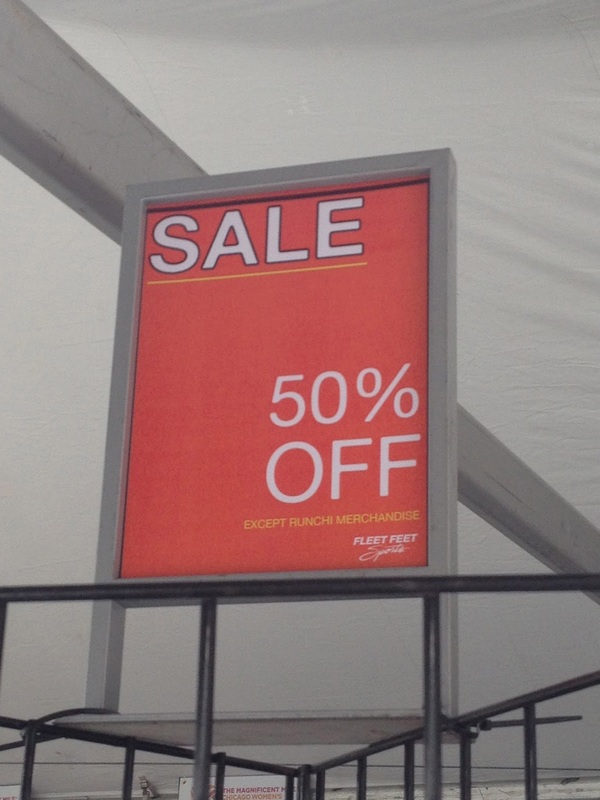 Fleet Feet's tent had apparel on sale for 50% off. 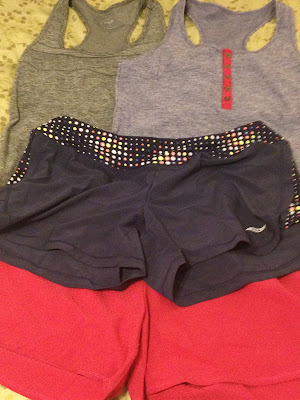 I know a lot of it is older styles/colors and end of season items, but I just couldn't resist and got a couple of tanks and pairs of shorts to see me through the last bit of summer. Saucony and Oiselle at 50% off makes this girl very happy. Then, yesterday evening, I made my way back to Pioneer Court for some candle light yoga. The event was presented by Lolë and ClassPass. Starting at 6:30pm, costing only $15, and billed as a way to "unwind from the week and get ready for race day", it seemed like a great event to help calm my nerves and keep me busy. I was a hair too early for check in, so I stopped by the Vita Coco booth to grab a bottle of coconut water. I normally don't like coconut water, but I was parched and hadn't brought anything to drink with me. I have to say that the lemonade flavor was pretty good, so maybe I've been drinking the wrong coconut water all this time. The best coconut water I have ever had. The lemonade flavor was nice and tart. Once they were ready for yoga, I checked in, signed a waiver, and found my way to a mat. One of the ladies I run with at Chick's Night was also at the class, and it was great getting to catch up and hang out a bit outside of our regular Wednesday night runs. The best part of the class? They not only provided the yoga mats, but you got to take your mat home with you at the end. There was also a free water bottle and a goodie bag filled with stuff, such as a two week trial membership to ClassPass, a coupon good for a free class at BareFeet Power Yoga, and a coupon for the Lolë store on Southport. Yoga mat, water bottle, goodie bag...I was happy to pay for the class itself, so all the swag was a really nice bonus. It was a pretty great experience getting to do yoga outside in Chicago, right next to the Magnificent Mile. And it was the perfect night for it thanks to some beautiful weather. The teachers were great, leading us through an hour long vinyasa class, and reminding all the participants that there was no right or wrong way to do yoga and that your pose may look different than that of the person next to you. Thanks for the great class, ladies! This morning, there was a group shake out run, which was led by some pretty amazing ladies: Lauren Fleshman and Summer Sanders. Before our two to three mile run, these awesome runners led us through a group warm up and shared their stories and passion with us, as well as giving everyone words of encouragement and a pep talk for the race tomorrow. Amazing athletes sharing some inspiring words with a group of runners. Lauren and Summer were also there after the run and were fantastic about meeting with runners to answer question, take pictures, sign autographs, etc. They were really lovely, and I was thrilled to have the chance to meet a couple of real athletes. A couple of the ladies that I've been training with all summer were at the shake out run this morning, too. It was so much fun having a chance to run together one last time before race day. Tonight's plan? Pack my gear check bag, lay out my race clothes, eat a healthy dinner, double check that I have everything I need in my gear check bag, charge all of the things (phone, ipod, watch), take a shower, and try to get at least a little bit of sleep before the alarm goes off bright and early in the morning. You sure are pretty, Chicago. 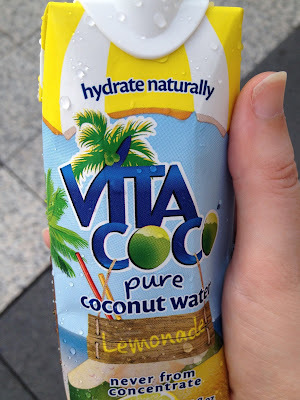 I've never tried lemon flavored coconut water- I'll keep an eye out for it!! That purple Oiselle tank, I just bought it at full price- it's part of their fall 2015 line! Great deal & cute! Enjoy today! I didn't realize that any of it was the new line! I just assumed that it was all this season or last season's stuff. Either way, I just can't say no to a good deal. 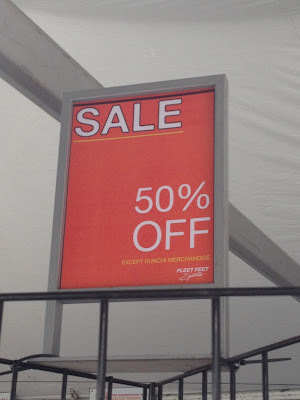 I knew I was in trouble when I saw that 50% Off sign!